Eastertide. Easter: More Than Just a Day. Easter Season. Part 1 What is Eastertide? Part 2 Eastertide: Fifty Days? Part 2 Fifty Days of Easter? What Would We Do? Note: This is an improved version of a post I wrote a couple of years ago. As a child, I liked Easter. Dressing up in new clothes for church, singing joyful songs in worship, going to my grandparents' house for an Easter egg hunt – I looked forward to all of these traditions each year. But, I must confess, in my mind Easter couldn't hold a candle to Christmas. After all, the winter holiday meant lights and decorations, favorite Christmas carols, acting out the nativity story, and, most of all, lots of presents under the tree. Christmas, now that was a fantastic holiday. Easter, well, it was a fine celebration, but decidedly inferior. After all, you can't exactly expect the Easter Bunny to compete with Santa Claus! As I got older, I remember hearing my pastor talk about the magnitude of Easter, even suggesting that it was more important than Christmas. When I first heard this, it sounded almost like heresy. How could any holiday beat Christmas? Even granting the importance of the resurrection of Jesus from the dead, Easter seemed to be at a decided disadvantage when compared to Christmas. Both holidays happened on a single day, of course, but Christmas celebrations lasted for weeks. Easter took up a few hours on one Sunday, and that was it, or so I thought. It wasn't until I was taking a seminary course in preparation for my ordination that I learned that some people – including many Presbyterians, much to my surprise – considered Easter to be, not a day, but a season of the year, and a seven-week season at that. Easter Sunday, in this perspective, begins a season in the church year that ends with Pentecost Sunday, the day Christians remember the outpouring of the Holy Spirit upon the earliest believers in Jesus. I was willing to grant that this was an interesting idea. And, by then, I did agree with my pastor that, theologically speaking, Easter was at least as important as Christmas, if not more (especially if you link Easter and Good Friday). But the notion of Easter as a season seemed theoretical at best. It certainly wasn't a part of my own Christian experience. As I have done in previous years, this year I want to write a bit on how we can give Easter its due. I've come to believe that, in many ways, Easter gets short shrift, at least in many Protestant and independent churches. As a result, we miss out on some of the richness and joy of a full Easter celebration. There's no biblical rule that says you have to celebrate Easter for seven weeks. But I believe that if we extend our celebrations of Easter beyond a single Sunday, the result will be a more vital and jubilant faith. In the next few posts I want to lay out some ideas for celebrating Easter as a season, not just a day. Some of these will seem obvious to you, though some, I'd expect, will be surprising. My goal, to be sure, is to stretch augment your understanding of the Christian year, much as I've tried to do in my series on on Advent and Lent. But I'm also hoping that I might enrich your experience of Easter, which, in the end, is really the experience of the resurrected Christ. In my last post I shared my personal discovery of Eastertide, the fifty-day season of the Christian year set apart to celebrate that resurrection of Christ and its implications for our lives. I had promised to explain a bit further how one might give Easter its due by devoting more time and attention to this crucial holiday. The basic truth of Easter is simple. In the classic litany of the church, it's this: Christ is risen! He is risen, indeed! On Easter Sunday we celebrate this good news, rediscovering for ourselves what the earliest followers of Jesus realized on that first Easter Sunday. Yet the implications of the resurrection are more than we can adequately ponder on Easter Sunday. Every year when I prepare my Easter sermon, I leave dozens of life-changing truths on the cutting room floor. There's no way I can begin to probe the depths of Easter in a mere 20 minutes. So I proclaim the basic truth of the resurrection and explain one or perhaps two implications. • You could meditate upon what the resurrection says about the character of Jesus Christ as the Righteous One of God (Psalm 16:10; Acts 2:25-28). • You might ponder the fact that death has been swallowed up in victory (1 Corinthians 15:54-56). • You could reflect upon the fact that the very power that raised Jesus from the dead is available to Christians today (Ephesians 1:15-23). • You might think of how the resurrection of Jesus is a precursor to your own resurrection (1 Corinthians 15). • You could consider how the resurrection gives us "new birth into a living hope (1 Peter 1:3). And so on. And so on. Eastertide allows us to think deeply and to pray extensively about what the resurrection of Jesus means, both to us and to our world. Now some of my Reformed friends who are less inclined to recognize Eastertide might at this point object: "Look, for us, every Sunday is a kind of Easter. That's why we Christians worship on Sunday rather than Saturday, after all. So why do we need a season to reflect upon what we should be thinking about every single week?" 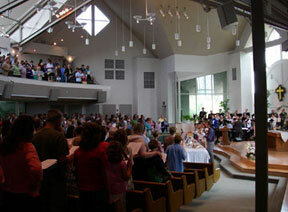 My answer is that many of us forget the Easter dynamic of weekly Sunday worship. Setting aside a season to focus on the meaning of the resurrection doesn't deny the importance of weekly Sunday worship. In fact, it can enhance it. Some of my evangelical friends would no doubt remind me at this point that the celebration of Eastertide is nowhere required in Scripture. This is an important reminder, because I do not mean to imply that every Christian must set aside fifty days for Easter celebration or else be in violation of Scripture. But I would argue that taking time to reflect intentionally on the biblical understanding of Easter, though it may not be required in Scripture, can certainly help us go deeper in our understanding of biblical truth as it pertains to the resurrection. If nothing else, recognizing Eastertide gives us a chance to take the truths of Scripture and to allow them to percolate in our hearts. I don't know about you, but I need this sort of percolation. What would happen in our lives if we went through each day with a sixth-sense awareness of the resurrection? What would we attempt if we truly believed that the power that raised Jesus from the dead was available to us? What difference would it make if we knew for sure that death has been defeated through Christ? Even if you aren't ready to view Easter as a fifty-day experience, perhaps you can take some time today to think and pray about some aspect of Easter truth that, to this point, you've neglected. If you do, you'll begin to taste the richness of Eastertide. Tomorrow I'll write about some other ways, besides thinking, that we can extend and deepen our celebration of Easter. In my last post I began to answer the question of what we might do if we were to celebrate Easter for fifty days. I explained that it's not as if we ought to repeat the traditions of Easter Sunday fifty times in a row. But there are many aspects of Eastertide celebration that allow us to delight in the resurrection of Christ and thus grow in our faith as Christians. One of the chief activities of Eastertide that I mentioned in my last post is deeper reflection on the meaning of the resurrection. Easter Sunday, as wonderful as it might be, allows us only to go so far. Eastertide opens up new territory for learning and reflection. If you're not in a place to impact your corporate worship, you can still do things to celebrate the resurrection. For example, if Lent is a season for fasting (giving up something positive), Easter is a season for feasting (adding something positive to your life). So, if you gave up chocolate for Lent, in Eastertide you might intentionally eat chocolate, enjoying the goodness of life and remembering that joy of the life to come. 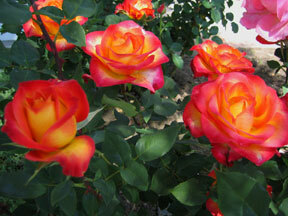 (Note: Easter is not a time for pigging out, but rather to affirm the delight of God-given life.) Or you might put a vase of flowers someplace where you'll see it regularly. 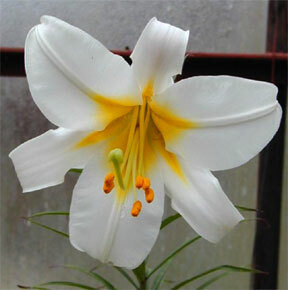 Many people buy Easter Lilies for Easter Sunday and keep them for several days until the blooms begin to wilt. One of my personal traditions, like in the seasons of Advent, Christmas, Lent, and Holy Week, is to play music with specific Easter themes. Strangely, however, given the importance of Easter to the Christian, there are not nearly as many well-known Easter pieces as there are Christmas or Holy Week compositions. In fact, I have only three recordings that I consider to be Easter-focused. 1. Johann Sebastian Bach's Easter Oratorio. This joyful cantata narrates the events of Easter morning. To hear a portion of this piece, click here (.mov 266K). The German words mean: "May praise and thanks, remain, Lord, your song of praise." To order the Easter Oratorio, click here. 2. Johann Pachelbel's Easter Cantatas. Yes, the composer of the omnipresent "Canon in D-Major" (.mov, 184K) wrote other pieces, including several Easter cantatas (vocal compositions with accompaniment). Pachelbel, by the way, was a friend of the Bach family, and had some measure of influence on Johann Sebastian himself. 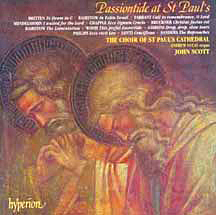 Among Pachelbel's cantatas is one entitled "Christ ist erstanden" ("Christ has risen"). The first few words are: "Christ has risen from all his suffering, of this we should all be glad." To hear a clip, click here (.mov 136K). To order the Easter Cantatas, click here. 3. My third Easter-focused piece of music may surprise you. I'm going to wait until next post to discuss it in some depth. Stay tuned . . . .
Last year in the week following Easter I did a short blog series called Easter: More Than Just a Day. In that series I introduced the notion of Eastertide, a fifty day season of the church year that extends from Easter to Pentecost. This year I want to add a few more thoughts in the same theme because Easter is still more than just a day. I won't repeat all of what I had said last year about the idea of Eastertide and how it didn't enter my consciousness until fairly recently in life. You can read all about that here, if you wish. And I won't write again about what we might actually do during the season of Eastertide. If you're looking for suggestions, I've got them here. Rather, this year I simply want to reflect a bit further on Easter. And I'm also not going to share what it's like to be a preacher on Easter Sunday. I did this a couple of years ago, and you can find it in my series: Easter from the Other Side of the Pulpit. So, now that you know what I'm not going to do, let me explain my plan for the next several days. I simply want to put up some reflections on Easter. No day is more important to Christians than Easter Sunday. Yes, I know that Christmas usually wins the popularity contest. But without Easter there would be no Christmas celebrations. In fact, without Easter there would be no Christianity. Of course I don't mean that the Christian faith depends on the celebrations of Easter Sunday. Rather, I'm referring to the fact that Christianity rests on the fact of Jesus's resurrection from the dead. The chancel of my church on Easter morning. When I was in college, I attended one of the oddest Easter worship services in my life. The university choir was exquisite, as always, in singing glorious Easter anthems. The readings were typical for Easter Sunday: resurrection stories from the gospels, etc. But the guest preacher offered up what only could be described as an anti-Easter sermon. I can't remember all of his points exactly, but I do recall that he someone combined Easter with Thanksgiving. His point, believe it or not, was that Jesus was a turkey, because he led everybody to believe in him, and then he died, and that was it. No kidding. This preacher went on to say something about struggling with faith and all. But his main point, as near as I could tell, was that Christ really didn't rise from the dead, but we should all believe anyway. Not much room here for Christianity without resurrection! Why does the resurrection matter so much to Christianity? Well, from a historical point of view, it explains what otherwise cannot be adequately explained: how a man crucified as a messianic pretender, like so many other Jews in that time of history, would soon be hailed by thousands as the Messiah; how a small Jewish renewal movement soon changed the face of history; how a tiny band of defeated disciples became an army of zealous evangelists, etc. Yet the resurrection matters so much, not only because it helps to make sense of early Christian history, but also because it says, in a nutshell: God won! Jesus won! Life won! Grace won! Love won! In the war between God and evil, between eternal life and eternal death, the resurrection is the crucial victory. It demonstrates the victory of God. I grew up in Southern California, where the sunrise service at the Hollywood Bowl always got lots of attention. Christians began celebrating Easter at the Bowl 1921, and the service has been maintained since then, with an occasional gap. When I was young, my parents would sometimes talk about going to this service, but the early hour kept us away. One year my church, the First Presbyterian Church of Hollywood, celebrated Easter in the Bowl, but at a more reasonable hour (about 10:00 a.m., as I remember). 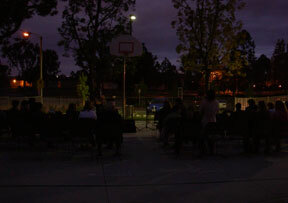 Being a night person by nature, and definitely not a morning one, I had never attended an Easter sunrise service until about ten years ago. We had started a band-led worship service on Saturday evening at Irvine Presbyterian Church, and the band wanted to do an Easter service. The previous year they had done a Holy Saturday service of reflection on the cross, but felt rather left out because they didn't get to do celebrative Easter music. The band wanted to do an Easter service on Saturday night, but I just couldn't cope with the idea of so much Easter joy on Holy Saturday. (Yes, yes, I know many churches do this, and that's fine for them.) When confronted with a choice between celebrating Easter on Saturday evening, or getting up before dawn to do a sunrise service, I opted for sunrise, even though I didn't relish getting up before the sun, and though I knew I'd be preaching four sermons that Easter morning. Our first sunrise services were in our church sanctuary because we didn't have a suitable outdoor location on our church campus. The fact that our sanctuary has lots of windows and lets in plenty of natural light allowed us to have some semblance of a sunrise experience, but it never felt quite right. Then, last year, we built a new office building, and in the place where our old modular office building had stood we put in a basketball court. This turns out to be a perfect place for a sunrise service. It's shielded from our neighbors who, I imagine, wouldn't enjoy hearing that Christ the Lord is risen today at 6:15 on Sunday morning. Moreover, from the basketball court you can actually see the sunrise. At least you should be able to see the sunrise. Unfortunately, on Easter morning this year there was quite a bit of cloud cover. Therefore nobody under 10,000 feet actually saw the sunrise in our neck of the woods. But this was a minor disappointment. We still had the experience of gathering when it was almost dark and finishing worship when it was quite light, cloud cover and all. At least it didn't rain! My friend Tim, a faithful sunrise service goer, suggested that there was a good theological illustration in our cloudy sky. We believe that Christ has risen, but we don't actually see the risen Christ yet. That will come only in God's future. I rather like Tim's point, and may use it later. It does help to illustrate the "already but not yet" dimensions of Easter faith. For those of us who brave the earliness of sunrise services, we mustn't feel too puffed up with spiritual pride. 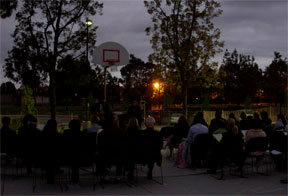 The sunrise service is actually a scaled down version of the traditional Easter vigil. This used to be a full night of waiting, including worship and prayer, but not sleep. It often included the baptism of new converts. In time, the vigil was shortened to a service that began late on Holy Saturday and ended early on Easter morning, shortly after midnight. 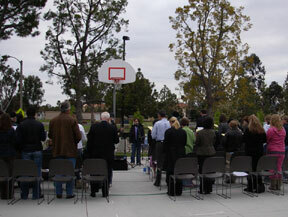 The sunrise service is another revised version of the Easter vigil. A few minutes before the sunrise service begins. In the first moments of the service. As the service ends. Maybe next year we'll see the sun. Though I still find it hard to get up at 4:55 on Easter morning, especially knowing that I have four sermons ahead, I'm always glad to be at the sunrise service. The drama of the light works perfectly with the drama of the Easter story. Not only do we remember the experiences of the women who went to the tomb very early in the morning to anoint the body of Jesus, but we also celebrate the rising of the Son with the rising of the sun. Such obvious and moving imagery even works for me at such an early hour. It reminds me especially of the prophecy from Malachi that reads: "But for you who revere my name the sun of righteousness shall rise, with healing in its wings. You shall go out leaping like calves from the stall" (4:2). Now that's something for which even I can get up early in the morning. On Easter Sunday more people attend my church than on any other Sunday of the year. The only exception is when Christmas Eve falls on a Sunday (which actually happens this year), because then we have seven highly-attended holiday services. So, as you can well imagine, I work extra hard on my Easter sermon, because it will be heard by 1,400 plus worshipers, rather than our usual 700. The Pope's Easter sermon gets few more hearers than mine, well, several thousand times more, actually. 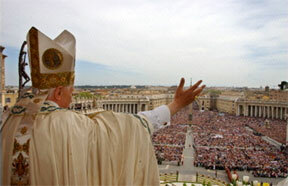 He delivers his message to around 100,000 pilgrims who have jammed into St. Peter's Square at the Vatican. And the televised version of the sermon is heard by multiple millions of listeners. It think it's safe to call this "the world's most heard Easter sermon." Since this was the first Easter sermon for Pope Benedict XVI, it received more than the usual amount of media attention. And, as would be expected, the media focused on the political elements of the sermon, while downplaying the majority of the message which was robustly spiritual but non-political. I thought I'd put up a few comments on the Pope's Easter sermon. 1. The sermon was short, a few words under 1,000, or about a third of my Easter message, which included around 3,000 words and lasted about 22 minutes. 3. Much of the Pope's language, in English translation, was quite powerful. He spoke of "the decisive and ever-present event of the Resurrection." He noted that "the tomb could not hold on to 'the living one' (Rev 1:18) who is the very source of life." By His resurrection, Jesus "opened the earth, threw it open towards Heaven." These are a few among many excellent lines. 4. As a Protestant preacher, I could deliver the Pope's Easter message without much theological adjustment. I would change only one line for reasons of theological emphasis. The Pope said, "[Christ's] resurrection becomes our resurrection, through Baptism which 'incorporates' us into him." I would say, "Christ's resurrection becomes our resurrection, through faith." To support my point I'd quote Colossians 2:12: "When you were buried with him in baptism, you were also raised with him through faith in the power of God, who raised him from the dead." I'm not saying baptism is irrelevant to resurrection (see Romans 6:1-5), but only that faith is more relevant. Of course this points to a key difference between Catholic and Protestant theological emphases. 5. More than a quarter of Pope Benedict's short sermon was focused upon socio-political affairs around the world. He spoke mostly about areas of violence and injustice in Africa, Asia, and Latin America. The words he used in reference to Iraq didn't come down in a partisan way: "In Iraq, may peace finally prevail over the tragic violence that continues mercilessly to claim victims." This could be said equally by a supporter or by an opponent of the U.S. effort in Iraq. It could not be said by the terrorists who continue to blow up innocent Iraqi citizens. The Pope's counsel with respect to the nuclear hot spots in our world (Iran, North Korea) called for "an honourable solution . . . through serious and honest negotiations." This line has gotten the most press, since it appears to preclude any military effort to stop Iran's nuclear program. Yet the Pope was clearly circumspect in this regard, in that he did not specifically call upon anyone not to do anything. Although I did not include a socio-political paragraph in my own Easter sermon, partly because I'm speaking to my own congregation, and not to the world, I could echo most of what the Pope said. What I appreciate, more even than his particular points of application, is his conviction that the resurrection of Jesus makes a difference, not only in matters of personal faith, but in matters of global peace and politics as well. 6. The sermon concluded with a clear, evangelical reference to Christ: "His Gospel totally quenches the thirst for peace and happiness that is found in every human heart. Christ is now alive and he walks with us. What an immense mystery of love!" Now that's what I call a strong conclusion to an Easter sermon! Part 1 of the series "Easter: More Than Just a Day"
It wasn't until I was taking a seminary course in preparation for my ordination that I learned that some people – including many Presbyterians, much to my surprise – considered Easter to be, not a day, but a season of the year, and a seven-week season at that. Easter Sunday, in this perspective, began a season in the church year that ended with Pentecost Sunday, the day Christians remember the outpouring of the Holy Spirit upon the earliest believers in Jesus. I was willing to grant that this was an interesting idea. And by then I did agree with my pastor that, theologically speaking, Easter was at least as important as Christmas, if not more. But the notion of Easter as a season seemed theoretical at best. It certainly wasn't a part of my own Christian experience. In this series I want to write a bit on how we can give Easter its due. I've come to believe that, in many ways, Easter gets short shrift, at least in many Protestant and independent churches. As a result, we miss out on some of the richness and joy of a full Easter celebration. There's no biblical rule that says you have to celebrate Easter for seven weeks. But I believe that if we extend our celebrations of Easter beyond a single Sunday, the result will be a more vital and jubilant faith. In the next few posts I want to lay out some ideas for celebrating Easter as a season, not just a day. Some of these will seem obvious to you, though some, I'd expect, will be surprising. My goal, to be sure, is to stretch augment your understanding of the Christian year, much as I've tried to do in my series on Advent and Lent. But I'm also hoping that I might enrich your experience of Easter, which, in the end, is really the experience of the resurrected Christ. Fifty Days of Easter? What Would We Do? Part 2 of the series "Easter: More Than Just a Day"
I'm sure some of my blog readers are wondering: "Fifty days of Easter? What would we do?" Surely I'm not suggesting fifty consecutive Easter egg hunts, or fifty new Easter dresses, or fifty ham dinners in a row. Celebrating Easter for fifty days is not duplicating Easter Sunday fifty times over. Rather, it's taking time to reflect upon and delight in the truth of Easter and its implications. 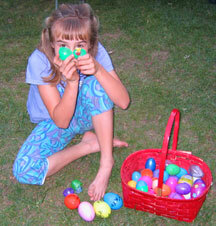 My daughter Kara showing me her "stash" of Easter eggs. Some of my evangelical friends would no doubt remind me at this point that the celebration of Eastertide is nowhere required in Scripture. This is an important reminder, because I do not mean to imply that every Christian must set aside fifty days for Easter celebration or be in violation of Scripture. But I would argue that taking time to reflect intentionally on the biblical understanding of Easter, though it may not be required in Scripture, can certainly help us to go deeper in our understanding of biblical truth as it pertains to the resurrection. As I was walking along today in a parking lot, I was thinking about how much death has dominated our news recently. First it was Terri Schiavo. Now it's John Paul II. Before I knew it I found myself reflecting on how the resurrection changes the way I think about death. On one level, death is still a sad thing for me, an occasion for grief and evidence of sin's power. But the resurrection assures me that death is not the end for those who are in Christ. Indeed, it's the beginning of a fuller, richer life for those who have died. Thus, even in the face of death I can have a "living hope." And so can you. If it hadn't been for Eastertide, would I have been thinking about this the implications of the resurrection as I ambled from my car to Lowe's Home Improvement Store? Probably not. Part 3 of the series "Easter: More Than Just a Day"
In my last post I began to answer the question of what we might do if we were to celebrate Easter for fifty days. I explained that it's not as if we ought to repeat the traditions of Easter Sunday fifty times in a row. 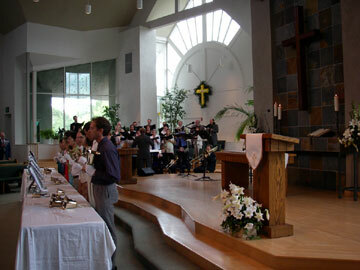 But there are many aspects of Eastertide celebration that allow us to delight in the resurrection of Christ. One of the chief activities of Eastertide that I mention in my last post is deeper reflection on the meaning of the resurrection. Easter Sunday, as wonderful as it might be, allows us only to go so far. Eastertide opens up new territory for learning and reflection. One of my personal traditions, like in the seasons of Advent, Christmas, Lent, and Holy Week, is to play music with specific Easter themes. Strangely, however, given the important of Easter to the Christian, there are not nearly as many well-known Easter pieces as there are Christmas or Holy Week compositions. In fact, I have only three recordings that I consider to be Easter-focused. Part 4 of the series "Easter: More Than Just a Day"
I ended my last post by promising to discuss one further piece of Easter music. Today I keep my promise. This Easter composition is truly marvelous. In fact, a reviewer of the first performance of this piece wrote, "The sublime, the grand, and the tender, adapted to the most elevated, majestic and moving words, conspired to transport and charm the ravished heart and ear." Now that's some review! The piece of music to which I'm referring is one of the most beloved and familiar of all time. It lifts the heart like few other pieces. And it conveys theological truth on par with the greatest hymns and anthems. It's most likely that you know this musical composition, and you may very well be able portions of it. To what am I referring? The celebrated piece by George Frideric Handel, Messiah: A Sacred Oratorio. 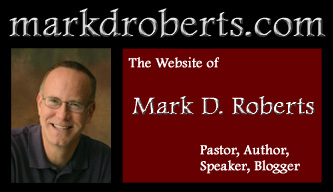 At this point you may wish to tap me on the shoulder and say, "Mark, excuse me, but we were talking about Eastertide. Of course Handel's Messiah is a fantastic piece of holiday music. But it's for Christmas, not Easter. I'm afraid you're a little confused." Confused, no. Confusing, yes, but just for fun. I'm intentionally playing with you a bit because we do, of course, associate the Messiah with Christmas. I'm well aware of this. In fact, a few of years ago I was blessed to join my church choir as we sang a substantial proportion of the Messiah for our Christmas concert. (To hear a short clip of our choir singing the Hallelujah chorus, click here [.mov 284K]). Moreover, I make it a habit to listen to the entire Messiah during Advent to prepare myself for a deeper celebration of Christmas. But, in truth, Handel did not write the Messiah as a piece of Christmas music. We know this for a couple of reasons. First, if you pay close attention to the words of the Messiah in the libretto written by Charles Jennens, you'll discover that only the first part of the composition has to do with the birth of Jesus. The second and third parts focus on his death, resurrection, sending of the Spirit at Pentecost, and the final resurrection of all believers. Second, the first performance of the Messiah occurred, not during Advent or Christmas, but in Eastertide. 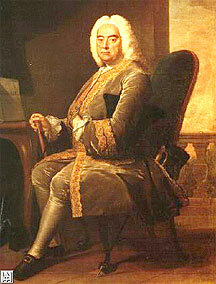 Handel's masterpiece was first performed in Dublin on April 13, 1742, 19 days after Easter. This is surely no accident. If Handel had envisioned the Messiah as a piece for Christmas, it would have been introduced in this season. Although you may be familiar with the Messiah, it offers many surprises if one carefully examines the libretto. For one thing, the lyrics of this piece are entirely from the Bible (though in a few spots Jennens paraphrased the Authorized Version). For another, though the story of Jesus is a New Testament narrative, the majority of the words in the Messiah come from the Old Testament. Moreover, the key events – the birth, death, and resurrection of Jesus – are not told with New Testament texts, but with prophetic passages from the Old Testament. For example, the Messiah doesn't include the words, "And she brought forth her firstborn son, and wrapped him swaddling clothes" (Luke 2:7). Instead, it celebrates, "For unto us a child is born, unto us a son is given," quoting Isaiah 9:6. In my next post I will inspect the libretto of the Messiah, looking especially at its presentation of the death and resurrection of Jesus, the composition's Easter core, if you will. Part 5 of the series "Easter: More Than Just a Day"
In my last post I explained why Handel's Messiah, a piece we ordinary associate with Christmas, is really an oratorio for Easter. Today I want to examine the libretto (the words of the composition) to show the strong Easter themes. The Messiah comes in three parts. I'll provide a short summary of each part. Part I focuses on the birth and life of Jesus. It begins with prophetic promises of the birth of the Christ, many from the Old Testament book of Isaiah. These include, for example, the Alto recitative: "Behold, a virgin shall conceive, and bear a son, and shall call his name Emmanuel: God with us" (based on Isaiah 7:14). The actual birth of Jesus is revealed, not through the words of Luke 2, but through the prophecy from Isaiah 9:6: "For unto us a child is born . . . ." Then the Messiah narrates the experience of the shepherds outside of Bethlehem, completing the birth story. The next section of Part I describes the ministry of Jesus as a fulfillment of prophecy, "Then the eyes of the blind be opened. . ." (based on Isaiah 35:5); "He shall feed his flock like a shepherd" (based on Isaiah 40:11). Part I finishes with the invitation of Jesus in Matthew 11:28-29, though this has been rephrased into the third person, "Come unto him all ye that labour" rather than "Come unto me." The final chorus of Part I celebrates the fact that "His yoke is easy and his burden in light" (based on Matthew 11:30). 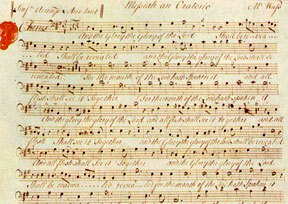 This is a portion of the Messiah in Handel's own hand. It is the chorus in Part 1 that begins: "And the glory of the Lord shall be revealed." Part II of the Messiah jumps immediately to the Passion of Jesus: "Behold the Lamb of God, that taketh away the sin of the world" (based on John 1:29). We are prepared for Jesus's death by Isaiah's prophecies of the Suffering Servant: "Surely he hath borne our griefs and carried our sorrows" (based on Isaiah 53:4-5). As in the case of Jesus's birth, his actual death isn't narrated using texts from the New Testament gospels. Instead, Isaiah 53:8 delivers the news of Jesus's demise: "He was cut off out of the land of the living, for the transgression of thy people was he stricken." Part II delivers the good news of the resurrection in a manner similar to its telling of the birth and death of Jesus. The resurrection isn't described so much as alluded to through prophetic Scripture, in this case, Psalm 16:10: "But thou didst not leave his soul in hell, nor didst thou suffer thy holy one to see corruption." (To hear the beginning of this Easter aria, click here [.mov 172K]. To purchase this marvelous recording, click here.]) Following this sweet soprano confession, the whole chorus bursts forth with Psalm 24:7-10: "Lift up your heads, O ye gates, and be ye lift up, ye everlasting doors, and the King of glory shall come in." Now all of heaven is being summoned to receive the risen Christ into glory. As Part II draws to a close, the libretto connects the victory of Jesus with the sending out of preachers into the world. Thus the Messiah blends the story of Easter into the story of the Pentecost, just as Eastertide bridges Easter Sunday and Pentecost Sunday. Part II ends most gloriously, with the beloved "Hallelujah Chorus." Yes, it comes, not in the Christmas section, but in the Passion/Resurrection/Pentecost section. "The kingdom of this world is become the kingdom of our Lord and of his Christ" not in the birth of Jesus, but in his death and resurrection. This will be communicated to the world, so that God "shall reign for ever and ever." One could almost accuse the Messiah of indulging a bit too much in realized eschatology here – the belief that the presence of Christ in the church and through the church in the world is equivalent to his second coming. But Part III of the Messiah keeps us from drawing this conclusion. Tomorrow I'll finish up this summary by examining Part III and then making some general comments about the Messiah and the deeper meaning of Easter. Stay tuned . . . .
Part 6 of the series "Easter: More Than Just a Day"
Part 1: Prophetic expectation of the Messiah; the birth of Jesus; the shepherds; the ministry of Jesus. Part 2: The passion, death, and resurrection of Jesus. His exaltation in heaven and sending of preachers into the world. "Hallelujah, for the Lord God omnipotent reigneth." Today I'll focus on the conclusion of the Messiah and some general comments. "The trumpet shall sound, and the dead shall be raised incorruptible" (based on 1 Corinthians 15:52). "O Death, where is they sting?" (based on 1 Corinthians 15:55). What could possibly follow this, other than 3 minutes and 22 seconds of "Amens"? (To hear a clip of the "Amen" chorus, click here (.mov 264K). A performance of Handel's Messiah lasts somewhere around 137 minutes, give or take five minutes depending on the pace of the conductor. The birth of Jesus ("For unto us a child is born") comes just about 25% into the performance. The resurrection ("But thou didst not leave His soul in hell") occurs just before the 60% point, which leaves 40% of the entire Messiah to focus on the fact and the implications of the resurrection. A substantial portion of this 40% concerns the resurrection, not of Jesus, but of those who believe in him. 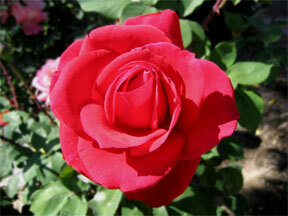 This red rose from my garden illustrates one of the colors of Eastertide, red, which stands for the church. Thus, from a structural point of view, the death and resurrection of Jesus are the denouement of the Messiah, with everything prior leading up to this moment, and everything afterwards following from it. In this sense Handel's composition mirrors the history of salvation, in which the death and resurrection of Christ are the very center of time, the place in which God defeats the power of sin and death. What I find particularly impressive about the Messiah is that it doesn't end with the empty tomb or the resurrection appearances. In fact, these aren't even mentioned. Rather, Handel carries the story of Easter forward to Pentecost and the preaching of the word, and even as far as the final resurrection of all people. Thus the Messiah is not an Easter Sunday composition so much as an Eastertide masterpiece. It points us to the broader and deeper implications of Christ's resurrection, while leading us before the throne of God where we offer "blessing and honour, glory and power" to the One who sits on the throne and to the Lamb. If you haven't listened to Handel's Messiah recently, I'd encourage you to do it. And as you do, celebrate the full blessing of Easter in this season of Eastertide.